This title presents an exploration of three of Augustine's central texts, the "De Trinitate", the "De Doctrina Christiana", and the "Confessions". It elucidates the principles of Augustine's theology of language. This is done in a systematic manner, which previous scholarship on Augustine has lacked. Augustine's principles are revealed through a close reading of these three core texts. Beginning with the "De Trinitate", the book demonstrates that Augustine's inquiry into the character of the human person is incomplete. For Augustine, there is a void without reference to the category of human speech, the very thing that enables him to communicate his theological inquiry into God and the human person in the "De Trinitate". From here, the book examines a central work of Augustine that deals with the significance of divine and human speech, the "De Doctrina Christiana". It expounds this text carefully, showing three chief facets of Augustinian thought about divine and human communication: human social relations; human self-interpretation using scripture; and, preaching, the public communication of God's word.It accepts the "De Doctrina Christiana" as laying theoretical foundations for Augustine's understanding of the task of theology and language's meaning and centrality within it. The book then moves to Augustine's "Confessions" to see the principles of Augustine's theology of language enacted within its first nine books. Augustine's conversion narrative is analysed as a literary demonstration of Augustine's description of human identity before God, showing how speech and human social relations centrally mediate God's relationship to humanity. For Augustine, human identity properly speaking is 'confessional'. The book returns to the "De Trinitate" to complete its analysis of that text using the principles of the theology of language uncovered in the "De Doctrina Christiana" and the "Confessions". It shows that the first seven books of that text, and its core structure, move around the principles of the theology of language that the investigation has uncovered. To this extent, theological inquiry for Augustine - the human task of looking for God - is bound up primarily within the act of human speech and the social relations it helps to compose.The book closes with reflection on the significance of these findings for Augustinian scholarship and theological research more generally. Incarnation Of The Word by Edward Morgan was published by Bloomsbury Publishing Plc in April 2010. 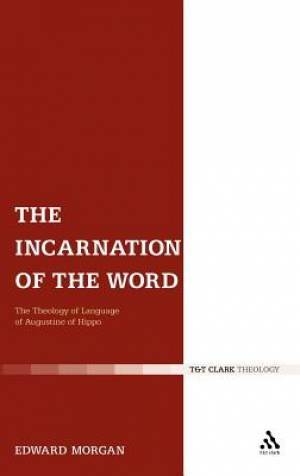 The ISBN for Incarnation Of The Word is 9780567033826. Be the first to review Incarnation Of The Word! Got a question? No problem! Just click here to ask us about Incarnation Of The Word.